Spring is a great time to hit the farmer’s market and explore your local flower stands for unique, seasonal blooms. 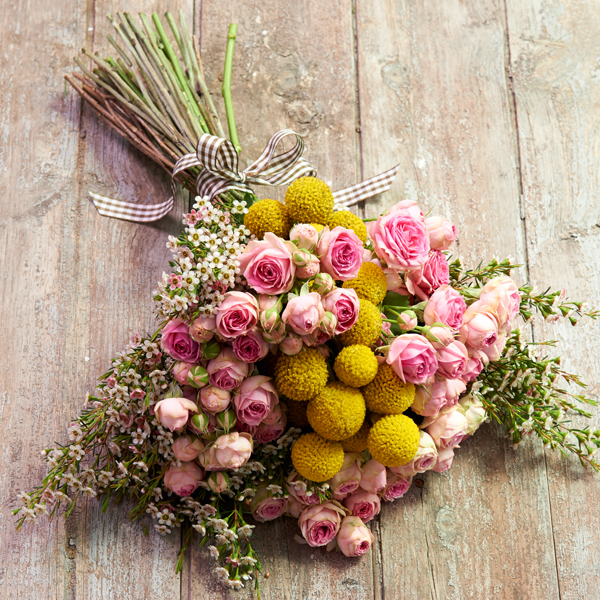 No longer only found at weddings, the hand-tied bouquet is a great way to display or give your favorite spring flowers. When choosing flowers for your bouquet you’ll want at least three elements – a focal flower, a filler flower and a unique texture. We used spray roses as the focal, wax flower as the filler and Billy Balls to add texture. Remove any excess leaves from the stems. The stems should appear clean. Arrange your flowers. We arranged ours in a more clustered fashion for a less traditional look. But you could go traditional with a more equally spaced arrangement. 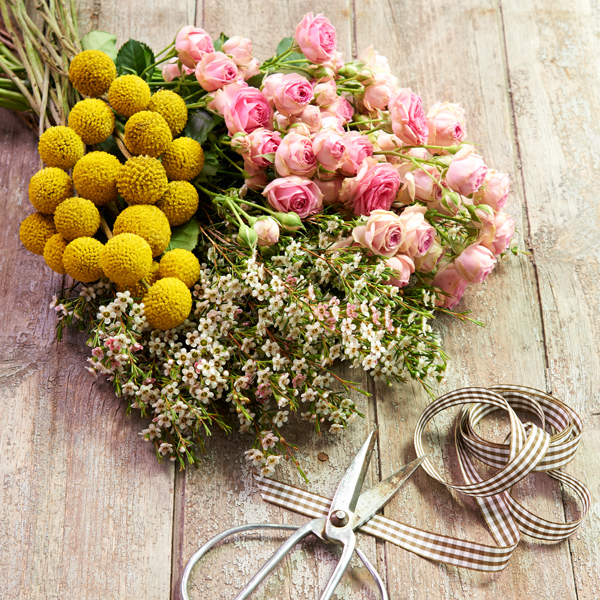 Wrap a printed ribbon several times around the stems about three inches from the bottom. Finish with a simple bow. Measure two palm widths from the top of the stems and trim excess evenly. Make sure you have enough room to hold your bouquet. Put the finished bouquet in inch or two of water until you are ready to carry your bouquet or give it as an impressive gift.